Apologies on the lateness of this entry - there's a full update on the way, I promise. Life has just been a little unkind recently, so I'm playing catch up with a lot of things. 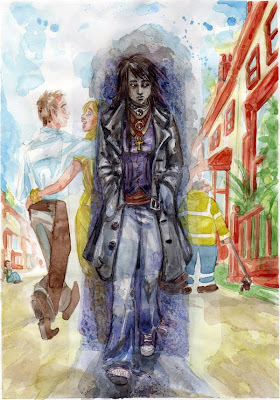 In the meantime, another piece of art from Jen's lovely artwork for our forthcoming graphic novel, Butterflies and Moths? That was a quick update! At least things are moving in the right direction.